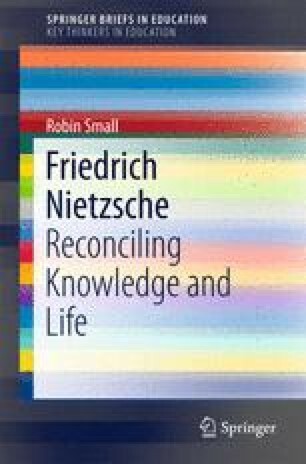 For Nietzsche, education is faced with the task of reconciling knowledge and life. The problem is that they are deeply at variance, given that living successfully is not made easier by insight into reality. Making life the only measure of value places the concept of scientific knowledge in question, as well as the values that moral education is supposed to pass on. Nietzsche argues that the traditional opposition of passions and virtues is a false dualism. These traits are closely linked: in fact, our highest virtues arise from our most disruptive drives through what he calls ‘sublimation’. One task of education is to promote this process of inner transformation. The aim will be the ‘sovereign individual’ who, as Nietzsche puts it, ‘has the right to make promises’. That capacity is the clearest sign of strength of character and willingness to take on responsibilities—something very different from being held responsible by others acting as moral judges.